JOHOR BAHRU: Johor Chief Minister Osman Sapian on Thursday (Jan 17) defended his decision to visit a Malaysian vessel anchored in Singapore waters, adding that his actions have been supported by grassroots leaders. Singapore’s exports fell 8.5 per cent last month from a year ago – its largest slide in over two years – dragged down by a drop in electronic and non-electronic shipments. 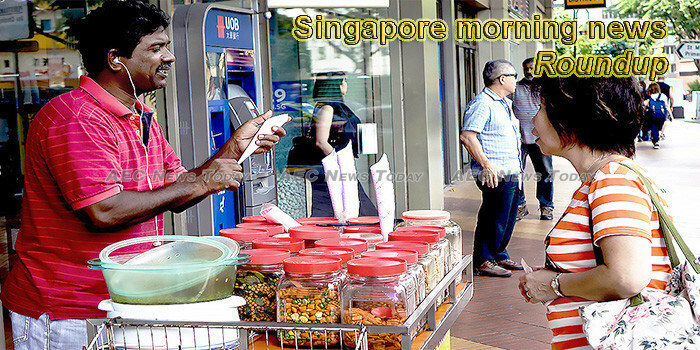 Hawkers will be able to receive NETS sales proceeds into their bank accounts on the same day of the transaction from Thursday (Jan 17), said NETS in a news release. Singaporeans eat three to five times more meat and eggs than is environmentally sustainable, according to a new study published yesterday in medical journal The Lancet and local data. But experts here believe it will be hard to adjust local diets to be planet-friendly. Those with degrees in health sciences saw the biggest paycheque of $2,523 on average. It was raised to 65 in 2018. A helpful breakdown of the expenses was included. Fundamental indicators are pointing to a positive investment outlook in 2019, UOB Asset Management (UOBAM) said in a media statement on Thursday (Jan 17). Craving a tub of rum and raisin ice cream at 10.31pm? From Friday (Jan 18), it will be legal to buy such alcoholic products that are not beverages from stores regardless of the hour, said the Ministry of Home Affairs (MHA) said on Thursday. THE size and structure of India’s economy make it an attractive market for Singapore’s consumer players, even amid fears of a global downturn. The fifth generation of wireless networking technology may not be commercially available here yet, but companies will soon be able to test the 5G innovations they are developing at a facility launched yesterday. Yesterday, MediaCorp’s flagship English publication, TODAY Online, published an article entitled “Singaporeans cancel CNY shopping trips to Malaysia as disputes drag on”. New enforcement measures aimed at tackling the use of set-top boxes to stream content from unauthorised sources are among the proposed changes to the Copyright Act, the Ministry of Law announced on Thursday (Jan 17). Thai Beverage Public Company Limited’s Stock Is Down 25% In The Last 12 Months. Is It A Good Business? We look at the business quality of Thai Beverage Public Company Limited from the perspective of return on invested capital. You have been to Singapore if you know that building with an iconic architecture on Beach Road in Kallang–the 46-year old Golden Mile Complex. Recently, there have been discussions on whether the building should be preserved or just demolished. HAVE you ever started a new job and had the realisation quickly dawn on you that you may have been deceived in the interview and, in fact, the reality of the role is rather different from the one sold to you during the recruitment process? SINGAPORE’S exports ended 2018 on a weak note with non-oil domestic exports (NODX) falling for the second straight month in December, dashing economists’ expectations of a 2 per cent rebound, according to Enterprise Singapore figures on Thursday. US-HEADQUARTERED communications and data services player CenturyLink launched its first security operations centre (SOC) in South-east Asia in Singapore on Thursday, to address the growing needs of enterprises in the Asia-Pacific region to handle cybersecurity threats. Embattled bicycle-sharing company oBike has a new majority shareholder who has struck a deal with its founders to take over the firm’s global business and clear its spiralling debt, TODAY has learnt. The Singapore Medical Council (SMC) has appointed a 16-member committee that will help ensure errant doctors get disciplinary sentences which are consistent and fair. Even after SingHealth’s high-profile data breach last year, many small and medium-sized enterprises (SMEs) in Singapore are taking the risk of cyber attacks too lightly, warn experts. The NCID takes over the functions of Tan Tock Seng Hospital’s Communicable Disease Centre (CDC), which closed on Dec 13 last year. Since then, the NCID has been treating patients at its outpatient clinic. Healthcare workers were ranked as the most motivated and less stressed. For those looking to adopt a healthier, more environmentally-friendly flexitarian diet, human nutrition specialist Tay Mia Eng suggests making a slow shift, starting with replacing some familiar foods with healthier plant-based options that are rich in protein.